His basic approach barely needs further explanation from the diagram on the left. There’s a standard back four, two hard-working central midfielders, two wingers who run with the ball, with a support player dropping off a main striker. It’s a 4-4-2, a 4-4-1-1 if you like, but near enough the most basic system imaginable in modern football. Trapattoni’s success has come because he’s accepted the limitations of his side. 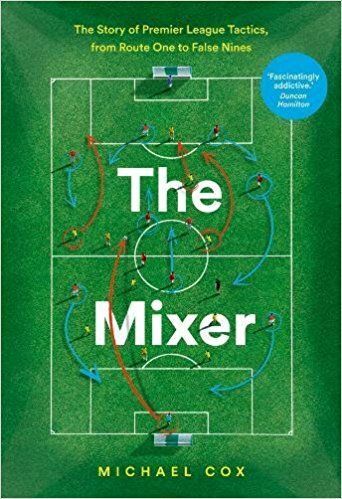 With Barcelona and Spain dominating club and international football the game has, more than ever, become based around technical quality in the centre of midfield. Good passing when you have the ball, positivity when you don’t have it, and a preference for an open game have become the qualities to aspire to. Ireland, frankly, don’t have a great deal of technical quality in their midfield. They have a fine goalkeeper, some good defenders, tricky wingers and a good deal of options upfront. In the centre they have Keith Fahey, Keith Andrews, Glenn Whelan, Darren Gibson and James McCarthy. Fahey and Andrews are Championship players, Whelan plays for a club that barely look to pass the ball, Gibson has (slightly harshly) become a figure of fan for non-stop ambitious shooting, whilst McCarthy is talented but barely established in the squad. Trapattoni, then, has decided upon a negative approach based around getting two banks of four behind the ball, then breaking fairly directly through the wide players and sometimes longer balls to the front two. It has proved successful – Ireland qualified losing only one game from 12 (to group winners Russia), whilst enjoying a particularly good defensive record, with six clean sheets from those 12 matches. He’s faced criticism for being too defensive, but it’s difficult to see how he can be more proactive given the lack of quality. Aiming for passing game for the sake of it would surely see Ireland undone even against relatively modest sides, and would essentially be shifting the battleground to a zone where Ireland are not particularly strong. Andrews and Whelan are unlikely to scare many opponents, whilst a two-man midfield can often be passed around easily by sides boasting both greater quality and quantity of central midfielders. He could change formation to one boasting three central midfielders, of course, and move to a three-man midfield. However, this would mean dropping either Robbie Keane – unlikely, since he’s the captain – or Kevin Doyle, which would Keane to play alone upfront, a role that doesn’t suit him at all. If the 4-4-2 is your ‘natural’ shape yet you don’t want to be outmanoeuvred easily in midfield, the natural option is to drop deep to prevent space between the lines, or in behind the defence. Whichever way you look at it, playing more attacking football looks suicidal. The main problem is creativity – the wingers have been inconsistent, but that’s what you have to accept from wide players in a defensive side. They’re starved of the ball, and therefore players are always judged based upon one or two actions. It’s difficult to see how this situation can be improved in terms of he formation or selection; the simple response of ‘playing more attacking’ is more likely to expose the central midfielders than benefit the wide midfielders. Ireland have a different type of squad to usual. As Miguel Delaney outlines, they don’t have a top-class footballer amongst their ranks but do have decent strength in depth, meaning that asking the side to work well functionally rather than relying on one or two individuals is the right way to go, and probably the only way they can perform above expectations. They don’t have many stars – even Keane and Damien Duff don’t have the pace and spark they did the last time Ireland qualified for a tournament. There seems to be an argument that now Ireland have qualified for Euro 2012, they need to break out of their shell and be more positive. In aesthetic terms? Well, that’s down to personal taste. In terms of getting results? Almost certainly not. If anything, the challenge for a defensive-minded team is to pick up enough wins to get through the qualification group, especially against opponents looking to play roughly the same type of football. A side based around ‘keeping things tight’ is more suited to a major tournament – certainly the knockout stages, and Ireland have shown in the past that it’s possible to draw your way out of a group. In modern times, it’s difficult to remember an outsider cause a surprise at a major tournament by playing anything like open, attractive football. South Korea in 2002 were fairly defensive, Senegal were occasionally exciting but inherently counter-attacking, and Greece in 2004 were the ultimate examples of a defensive-minded side excelling through organisation and opportunism at set-pieces. 2006 and 2008 largely went to form, and 2010 saw surprise packages Uruguay, Ghana and Paraguay all based around organisation rather than creativity. Look at this year’s Copa America, where the first knockout round saw the four reactive sides (Venezuela, Peru, Uruguay, Paraguay) progress past the four sides who wanted to play good football (Brazil, Argentina, Chile, Colombia). For various reasons, proactive football isn’t particularly successful at international level – the fact that Spain are the World Champions shouldn’t dominate the debate too much; overall trends are more important than one-offs, whilst Spain have the unique advantage of being able to field the majority of a settled, highly successful club side. So not only does Trapattoni possess little quality to attempt to outwit opponents in an open game of football, he’d also be going down a route which has few, if any, notable recent success stories. That’s not to say Ireland can’t offer more going forward. Small aspects can and should be worked on – Andrews broke forward more away in Estonia, and if Ireland are to make more of an attacking impact, transitions from defence to attack must be quicker. The overall structure and approach, however, should change as little as possible to maximise the chance of a shock. I would largely agree with the brilliant analysis once again. However one thing that might be add is to the comment about the shift in the role of Andrews from his group performances. Trap seemed to allow him in the 4-0 win in Talinn, to act in a more pro-active role. It was argubly Andrew’s finest performance in a green jersey as he was generally freed from playing a holding role. This allowed to get further up the pitch and really tested Traps tried and tested system of long ball and wing play. I think it was that extra link which gave much more attacking potency and freed Walters (who had a fantastic game) from the schakles that Kevin Doyle is usually forced to play under almost acting as a creative midfielder. This often leaves an ageing Robbie Keane way too isolated. The Irish system works optimally when this is the system, as was clear from the near miss in Paris and the 1-0 victory over Itlay last year in the friendly in Belgium. This is mainly why I think Mc Carthy would be a fantastic fit in the side. Honestly the wing play has been a little underwhelming this campagin in comparison to other campagins such as the 2002 World Cup. Its clear age in becoming a factor with Damien Duff who has become visibly slower in working the channels, and Mc Geady has become far too conservativeand far less creative than in the past. This has manifested itself in the over-utilisation of the long ball stragety which might work to our advantage against physically weaker teams! Still sucess, albeit limited, is preferable to the Scottish Welsh and Northern Irish situation! 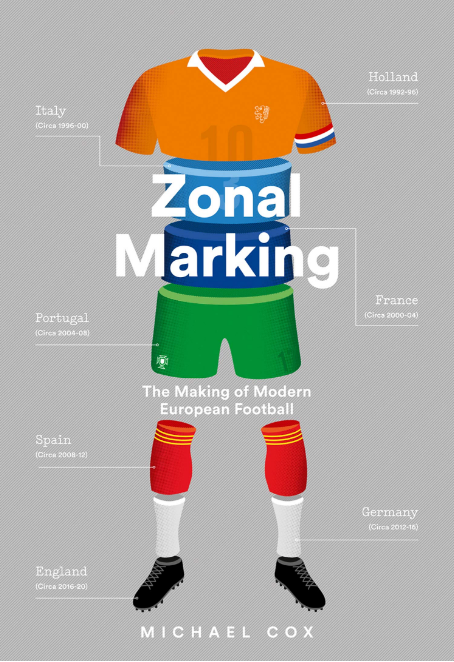 Defensive football has become increasingly disparaged with the rise of possession based Dutch total football (which appears to be conservative anyway, not taking risks, not letting the opponent have the ball). It is nice to see it getting the plaudits it deserves. For lesser nations, reactive football is a way of life. Sometimes it can be horribly boring, but counter attacks are one of the most beautiful sights in football. I really hope that Capello sticks to his guns and keeps a defensively sound England team structure heading into the Euros. England have failed time and time again when trying to be more proactive. Capello has them playing as a team (finally) and long may it continue. You’ve given me nightmares of a Gerrard return to fitness and automatic England first team selection in time for the Euros. Gerrard is a big no-no. Undoubtedly talented but if the system isn’t built around him (something that can in no way be justified for England now) then he unbalances whatever system he plays in with his Roy of the Rovers act. Gerrard: stay injured for another eight months please. Gerrard plays so much more poorly for England than for Liverpool that it would be wiser to view him as an “impact substitute”. Playing Rooney as the lone striker in a so-called 4-3-3 (realistically a 4-5-1) invites him to lose his rag and get sent off. I think England should stick to the team-based defensive strategy that worked, at a narrow squeak, against Spain: even last night’s borefest identified two more players with merits in that scheme – Downing and Walker. P.S. Last night, why did Terry keep giving the ball to Carson when he clearly didn’t want it? Very unfair on Gerrard, he hasnt been that bad for England, he just hasnt been used to the best of his ability, while when he has, he hasnt done it consistently (Something i think he would agree with) but then who really has? Gerrard in a midfield 3 could easily work. He is okay defensively, and with 2 other deeper midfielders could still keep England solid. While he is a good goal threat, caa get forward well and link with the striker. Looking at the spain game, Gerrard could have played lampards position (maybe even better). His main problem (same with lampard) is a lack of creative passing, but if England arent gonna play a expansive game, then it shouldnt be a big worry. Since the poor chap seems to be crocked a lot, we may neither of us find out more about how best to use him. Good summary of the situation Michael. You are right to point out the deficiencies in the personnel but pundits and fans usually answer that by citing his exclusion/ non-pursuit of Andy Reid or Stephen Ireland or not introducing McCarthy or Fahey quickly enough he is compounding the problem. With the exception of Stephen Reid, who had some decent performances in midfield at the beginning of the WC2010 campaign, I don’t think that would make a significant enough difference. What is more worrying from an Irish point of view is our inability to put teams to the sword where we are on top the away game in Slovakia in this campaign being the case in point. As Miguel puts it in the below article, it wouldn’t take too much of an adjustment in tactics to perhaps make this a reality. As an Irishman its good to get the perspective of an outsider analyst looking at our team. To many pundits here in Ireland have unrealistic aspirations about the ability of our team to play a more expansive brand of passing football. Trapattoni has built a team that builds on our strengths, and negates our weaknesses as much as possible. One experiment I would like to see in the side is the use of Norwich’s Wes Hoolahan played behind one of our strikers. Hoolahan has a superior passing ability to anybody else in the squad and his ability to drop deep and link up play may be a useful change against superior sides. Hoolahan looks a good player, from what I’ve seen. Who would you drop, Doyle? Im not sure whether to drop Keane or Doyle. Or if he would work better playing through balls to the pacey Shane Long. I would certainly like to see us experiment with Hoolahan in some combination for the next friendly. Hoolahan looks a good player but ‘the system’ that Trap talks about would have to be changed for him to play so i cant see him getting a chance. Its unfortunate but even players like Coleman who would fit into ‘the system’ struggle to get chances although i’d say he will now in the friendlies we play before Euro 2012. Does anyone else think Fahey should have started last night as we attempted to pass the ball more than usual? I didnt include McCarthy as I don’t believe Trap would have considered him ahead of Fahey and Trap says he doesnt fit ‘the system’ too. I find it absolutely bizarre that the article did not mention Hoolahan, and that he somehow hasn’t made it into the squad, let alone the starting line up. Tactically it’s justifiable to not include him in the first team, as the article highlights well, but as a Norwich fan who has watched him for years now, i’m not sure what more he has to do to get a call up. In terms of technical quality and vision he is still by far the best player in our side,which is a good passing side. His first touch and movement are exceptional. Clearly he could work on his denfesive game and finishing, but when examined in the context or Ireland’s squad his omission seems hard to justify. Would love to see Hoolihan come in instead of a CM like Whelehan! Also the suggestion below about Fahey would be a class option! Ireland look solid defensively. Given is a fantastic goalkeeper (Irelands best player?) and the CB partnership of St ledger and Dunne is well balanced and experienced. At fullback, Oshea looks a good option on the right, but Ward could be exposed at LB, as agaisnt top class wingers, he can be outpaced and doesnt get a lot of help from McGeady. In midfield i like Whelen and Andrews partnership. Whelen is a underated passer (he is the only player at stoke that can pass, its why he plays every game). He is great positionally and consitently passes the ball well outwide to the wingers. Andrews plays simple but effective passes and breaks up play well. He also can get forward to good result (as shown in the estonia game). The midfield does lack creativity, and can be starved of possession when outnumbered, but it provides a good shield to the defense and good distribution to the dangerous players. Outwide Ireland can look dangerous, but not consistently enough. Duff provides pace (although he is slowing down with age) tricky dribbling and a fierce shot. He is poor at crossing, but looks dangerous when he makes inside runs into the penalty area, and should look to do it more often. McGeady also provides pace and tricky dribbling, but brings the option of good delvvery into the box. But he doesnt score a lot of goals himself, and doesnt look comfortable dribbling inside, where his long range shooting is poor and his passing even worse. He needs to improve this, as better teams will show him inside if they know he wont be dangerous, and vice versa with duff if he cant produce from outwide. But they both provide pace for counterattacks and if they are underestimated then they could spring a surprise. Up front, Doyle does a excellent job (and walters looks a good replacement if needed) of leading the line. He is great in the air (important as both irelands best sources of attacks are either crosses or long ball) and presses the CB’s relentlessly (disrupting build up play from the back). He also holds the ball up well and is a good outball when Ireland are under pressure. His only fault for Ireland is his poor finishing, as he can waste good opportunities. Keane is a good captan and raises his level for Ireland probably more than any other player. His is a great finisher and provides excellent runs, while his build up play is good, he drops deep and gives the midfield a good option and can play some great passes. But he does give the ball away a lot trying over ambitious moves, and his defensive work leaves a lot to be desired. He does press (though not nearly as much as doyle) but he stays high up the pitch when he could drop deeper and try and help the midfield from being outnumbered. Overall, this Ireland side should reach the quarter-finals and maybe with a lot of luck the semi finals. They are solid defensively and have some good options in attack (mostly on the break). The wingers provide pace, Doyle can keep the ball high up the pitch and Keane can score goals at international level. But they dont have a plan B at all, can be dominated and will need to hope for no injuries before the Euros. The team reminds of what croatia are trying to do now with there 442, but while Croatia have more talented players, I feel this Ireland side can go further as they have a much better team atmosphere, which is the best quality of this Ireland side. I seem to recall McGeady rescuing Ward on several occasions when he had been caught upfield. Got to say I agree with much of the article. I would also add that James McCarthy should have been utilised more frequently but one of Ireland’s strengths has been the continuity of the Whelan-Andrews partnership. It’s always beneficial for a national side to keep a settled core over long period of time and I think this – along with Dunne-St. Ledger at the back, Keane-Doyle up front – has contributed to their good campaign. On Damien Duff, I think he is a very good defensive player – good positional awareness and support of his fullback – and his use of the ball is sensible rather than creative. This to me suggests that he would benefit from the presence of an overlapping full-back rather than a conservative one. This is the one major change I think could be made and surely someone like Seamus Coleman would be perfect for the role? Even if it wasn’t part of the ‘Plan A’ it would be a good option to bring something different for they are a little over reliant on hoping McGeady can produce something from nothing. He suffered a similar problem while at Celtic and it puts a lot of pressure on him IMO. Liam Brady has suggested playing a 4-3-1-2 with McGeady as the trequartista, and Fahey in the middle with Whelan & Andrews. Given Duff’s inability to be any way penetrative when playing on the right (see the first leg on Friday, for instance), it may be time for him to step aside. But I would say that’s about as “advanced” as Ireland are capable of playing tactically. I think McGeady in a more central role is something that should be aimed for long-term. Whether it’s in a 4-3-1-2 like suggested or not I’m not so sure given it’s potential for lack of width. He is stifled in a 4-4-2 IMO and sides sometimes find it easy to double up on him (another problem he had at Celtic). Even playing in one of the wide positions in a front 3 may help him a bit. A problem with any of these suggestions is shooting, I expected it to improve after leaving Celtic but it hasn’t. Can any followers of Russian football tell me how he is deployed for Spartak Moscow and how he’s been doing? Long’s quick: is there any point in experimenting with him on one wing? Just about the Copa America (and the broader point about proactive football not being particularly successful at international level) and if I may nitpick – while the quarter-finals did go that way, I thought Uruguay did end up winning the final coming out of the blocks very fast from the start against Paraguay and doing their best to disrupt what was a very well organised defensive unit. I also remember it being fairly similar for Uruguay after half-time against Peru in the semi-final. Thinking of the teams that won the Asian Cup and Gold Cup this year, and of how the Euro qualifiers have gone in general in the past 14 months, I still think it’s a fairly even balance between the success of proactive and reactive approaches. But as for Ireland, I’ve actually thought they’ve played reasonable enough stuff against Armenia and Estonia, certainly when compared to the non-event home game against Slovakia. Unless Trap goes back to that and say puts the brakes on Andrews getting forward I don’t the debate about the style and supposed need to broaden it is as pertinent as it was. Uruguay was the favourite against Paraguay and Peru so they played a more proactive style. Not sure what teams you were referring to in the Asian and Gold Cup but Japan and Mexico were technically superior against majority of the teams in their competition so they played a more proactive style as well. While I don’t expect Ireland to change their system fundamentally, nor do I think we should, I like the suggestion that we should have at least a back up plan if we have injuries or things aren’t going in any way to plan. As someone suggests, we have two creative/technical midfielders (who haven’t soured things with the international set-up!) who are best suited to a midfield three, or at least being dropping off the main striker and taking the ball to feet – Wes Hoolahan and James McCarthy. Dropping our big-man doesn’t suit Keane and dropping Keane doesn’t suit the team and he’s the best goal-scorer we have. 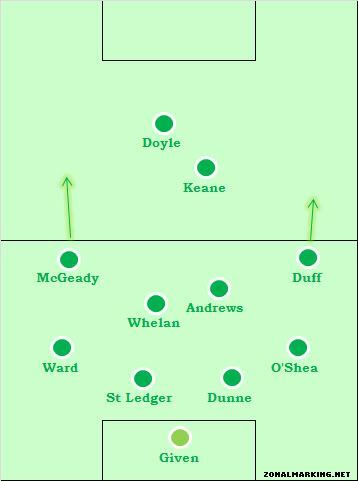 The suggestion of an alternative (by Pat, above) of playing one behind two front men and three in the middle of the park (Fahey with the two regulars) is an interesting one, though I’m not sure how much it would suit the Irish passing ability – it lacking width and driving everything through the middle – would require a lot of attacking from full back, i.e. stick Duffer at left back and Coleman at rightback and tell them to get on forward while the midfield three stay put. Probably massively fanciful, and I don’t actually foresee it occuring at all, but it might at least be a plan B that would play somewhat to our strengths (big man/little man up top, industrious, defensive central midfielders) if we suffer injuries to Duff and McGeady. good piece except under the heading “Defensive Base” the first sentence is a touch … opinionated, hehe, I’d remove the words “a negative” and replace with “an”, you seem very balanced over the rest of the article, defending the style of play etc. I don’t know much about most of the Irish but … I’d look to making sure the two central midfielders aren’t actually defensive midfielders (in today’s terms) but are midfielders who defend … a lot of the problems with defensive midfielders is that most are very, very limited in (technical) qualities so you’d ideally want a hard working players with good ball skills in passing (both short and long) and with maybe the skills to make little runs in the centre of midfield after just having regained possession to shake lose an opponent before playing it (wide) forward. Trap has always been a reactive/defensive manager. Remember when he was manager of Italy and how they flamed out at international tournaments due to being so defensive even though he had players like Totti, Vieri, Del Piero, Pirlo at or near their peaks. As soon as Italy took a lead under Trap they would shut down and go into a shell instead of going for the second goal to finish them off. See South Korea game and the Sweden game. Do you think that international football will continue to get more and more defensive as time goes on because of players not playing together for club and country or even playing in the same league? These guys all know each other sure, but how much can they really know about how one another plays if they don’t at least play in the same league? At some point, maybe not for Ireland but maybe, would a manager for a national team start fielding lesser talented players but ones who play together? Essentially sacrificing individual talent for more cohesiveness among players that play together? A lot of countries (France or Italy for example) tend to use their friendlies and U21, U20 etc matches to play players who they think will age together but probably wont play at the same clubs. This is also why they tend not to promote U21 players to the senior team. Seen in this light friendlies and youth tournaments are very important (not that you would know it from reading the English press). It’s a shame good England U21 players always get pulled by their clubs, and that managers insist on 45mins only for this or that player in a friendly, as it reduces the time they get to know each others thinking and movement. Obviously this behaviour is understandable from the managers point of view, considering how many matches the top clubs are likely to play (the top clubs of course being the ones who have the money to hoard the talented youngsters). I cant really see club season being shortened as the top clubs make so much money per match. I suspect there will be fewer international qualifiers (aided, unfortunately, by increasing the number of teams per tournament) and more reactive, defensive football. Great analysis and Trapp has gotten his tactics spot on – at the Euro, though, I think they will have to hope for an odd goal on a set piece to win a game, or maybe try to advance with two draws from three games. Very disrespectful to Clinton Morrison. 2 absolutely quality players there ZM and Lemonade, Gary Breen gotta be up there as well!! Gary Doc plays for the team I support (Charlton Athletic) he’s absolutely useless, but what a legend though! In all seriousness about Ireland, Trap has done an awesome job! He’s getting the best out of what he has, he ain’t trying to make Ireland what they aren’t, and he’s doing extremely well. Glad the Irish have made it though, they’ll sure go to P/U and have a great time! We’ll drink eastern Europe dry! Trapp deserves great credit for the way he has organised the Ireland team. He is a realist and probably knew from day one that playing open, expansive football would not suit the players at his disposable and has adjusted his tactics accordingly. Having watched England v Spain, it would appear that Capello may be trying to do something similar with England. It may not have been pretty but from my point of view, playing that way (especially against the top nations like Germany and Spain) represents England`s best chance of success next summer. What was interesting about the England v Spain game was the fact that although the crowd seemed to understand and buy into the way Capello was trying to get a result, some of the journalists in the written press still slated England`s style of play in their match reports. This leads me to think that some of these so called journos need to get real and instead of burying their heads in their laptops and mobile phones (as I have seen swathes of the press do regularly at matches), they need to actually concentrate on what is going on out on the pitch. Thanks to the paucity of coaching in this country and twenty odd years of Charles Hughes long-ball dogma, England do not have the players with the technical ability to beat the top nations with a proactive approach. I think the interesting contrast b/w Euro’s and World Cups for an bigger nation like England who’s strength lies in reactive football (organisation and counter attack) is that at the Euro’s you start in a group that will usually contain you and at least one other fancied team whilst at the World Cup you all too often often don’t. Capello will find it easier to defend his way through a tournamanet in Poland and the Ukraine than in South Africa because his players will not get slated for for failing to hammer sides that in the minds of the press and fans are considered, wrongly, to be “minows”. I think its interesting the England’s best football under Svenn was in 2002 when he had Argentina in the group. Our players could win plaudits for playing solid, organised and reactive football from the off (even though they were actually 2006 and 2010 level poor in the first game against Sweden) because it brought a win against Argentina, the most proactive side in the competition. His big letdown was against Brazil where, having conceded two silly goals, there was no way back into the game for his side. Put England in a group like the one’s in 2006 and 2010 and they are expected to dominate, they fail to live up to expectations, their confidence plummets and they go home once they meet the first decent team they play. Put them in a group with France, Spain, Holland etc and they might just get off to a good start. Trap has been getting too much criticism in Ireland recently for the lack of attractive football in the side. Ideally, as an Irish man, I would love to see beautiful football played by my country, but I would take the results before the football. In his 40 odd games as manager, Trap has only lost eight games (two of them competitve ones). And if you look at Steve Staunton as another example, whose philosophy is made up of more attractive and less defensive football, we lost 5-2 away to Cyprus (I know, shocking!) 4-0 at home to Holland and also finished 13 points behind the winners of our Euro 2008 group, Czech Republic. Trap understands the limitations of the Irish National Team, which is why he plays to their strengths. Hardworking, defensive and passionate football makes up our team. So, Mr. John Delaney, Ireland would not be in the same position if Trap was not head coach. Give him a new contract for goodness sake and we can enjoy more fruitfull experiences at international level! That meant to be Cyprus (oh no even worse!) not Greece. Great article. Reminds me of the ‘right of the weak’ that the Italians used to talk about. No coincidence as they have an Italian manager. Miguel Delaney? You mean the unemployed football “journalist” who’s been tweeting countless messages of praise and worship to you on twitter in the hopes you’d help him find a job? Oh well, I suppose you’ve done your bit. Don’t give up, Miguel! As usual a great article ZM, it ignores all the nonsense you hear from Eamonn Dunphy etc about how we should be playing more attractive football, when of course it would be absolutely impractical for us to do so. Tactically, I think we are well set up, however I think our wingers are set up incorrectly. Duff and McGeady, the first choice wingers, are played as inverted wingers, and I think this hampers them somewhat (particularly McGeady). As pointed out in the article, our main source of attack is through our wingers, but because they are inverted, they immediately look to turn inside, onto their stronger side, and away from an ideal crossing position. This does not affect Duff as much, as he is still a good crosser on his right foot, however, for McGeady, I think it makes him a lot easier to contain. When he receives the ball, he takes a touch on his (stronger) right foot, which immediately takes him inside, and crucially, it gives time for an opposition midfielder to get across and double up on him. McGeady is a very, very frustrating player, but I think if he was played on the right-hand side it would make him a more effective player. Nice article. It’s funny, as an Australian, all you would have to do is change some of the names around and this article could easily be about us. The structure, types of players and general situation seem almost identical. Capello should draw lessons from this Irish success. He too should organise around a defensive strategy. He’s got tremendous pace on the wings available for counterattacks: Walker/Walcott and Cole/Agbonlahor. A key for Ire in the future to having a more progressive forward thinking approoach is to have the two Scottish boys playing centrally. McGeady is two footed, and has the ability to be a real goal threat playing the qb position behind the main striker (most prob not Keane) thinking Long, Doyle, maybe Walters in a 4411. He can be at his creative best, can link well, pacey in short fits and starts and can spray to onrunning wingers/fullbacks. He’s also busy enough to close down and cover off defensively much better than he does currently out wide imo. Young McCarthy does have the the technique, vision and composure to provide a real step change in quality vis the current style of midfielder, the closest thing Ire have to a Xavi/Iniesta, no laughing at the back there.. Got great control, can play in tight spaces, good passer, good movement, got a nice creative side, has the vision to spot a pass, and the energy to get forward and support.. Positionally is improving, although does benefit from a protective (enforcer type) partner in a midfield 4, better suited to a 5, but being so young should only improve..
FWIW i don’t see Trap changing much if anything between now and then, and to have the best chance of success i agree with ZM nor should he! I think that Trappatoni has succeeded where Klinsman, at least initially for the USA, has failed. One of the most important qualities that a National team manager has to have is the ability to assess the talent level of his player pool and coach to that level. I think most people will admit that the Irish don’t have the Messi’s or Ronaldo’;s of the world to pick from but they do have committed, passionate, professional core athletes with a sprinkling of talent at certain positions. When Trappatoni came in, he saw that and started to drum into his players that if they could defend properly, then they would have a chance to make the top tournaments. the players took a while to catch on but to their credit, the Irish FA stuck with the Italian and all the hard work has paid off. I only hope that US Soccer has the same level of patience with Klinsmann. It’s been a rough ride up to this point but the win against Slovenia has definitely helped convinced many less soccer savvy people that he might be the man for the job. Trap’s head seems to be harder to get into than most managers, but one thing which jumps out is he is clearly a man of immense discipline. That shows in the way the side play & it’s exactly what Ireland needed after ‘The Gaffer’ years. …Among other things though, one that really baffles me is why the inverted wingers? Surely this is counter-counter-attacking? McGeady must constantly check-back onto his right before getting a cross in when playing from the left, generally giving the opposing FB another bite-at-the-cherry. Neither Duff or McGeady are well known for there goal scoring when cutting inside, there are no real over-lapping FB’s(Ward’s last game ignored), and not as if either player tucks inside to bolster numbers in midfield. Bizarre! Great article. Probably been already said somewhere in the comments but the fact that our full backs are generally not allowed go forward makes life difficult for the wingers. It means very little variation in our attacking play and makes it easy to defend against. Since Ward has come in there has been a little more adventure but it needs to be encouraged more and on both flanks. At one stage in the home Armenia game Ireland were working the ball around using extra man that we had. Andrews got the ball in centre midway in their half, the whole right wing was open space so Andrews instinctively looked for advancing full back……who back in our own half marking nobody. To anyone with any sort of football brain it was unnatural. That’s my only real criticism of Trap. Good article, and an accurate assessment of the team as it stands. Like other commenters, I think Wes Hoolahan is worth consideration. Mind you, I’m sure there will be plenty of opportunities for guys like him, as well as Coleman, McCarthy and Best to get a chance. I’d be very interested to see Hoolahan in particular, and whether he could do the things that Whelan and Andrews do well – it’s clear that Trappattoni is looking for midfielders to be workhorses and defensive minders first and foremost. If you could get midfielders who can do that and provide some creativity and drive, so much the better. I think Darron Gibson was meant to be in this role – alas, his confidence has taken a battering over the years. That’s why I wish Stephen Reid would reconsider his self-imposed international retirement – great distribution, a willingness to shoot, and provides and doesn’t treat the ball like a hot potato. Ireland actually used a similar midfield pairing to Whelan and Andrews in 2002, with Holland and Kinsella filling in after Roy Keane’s walkout: the main difference being, they were far better footballers (than Whelan and Andrews, of course!). A place will have to be found for Coleman in defence – Stephen Kelly loses the ball too much, and the very least you need from a full-back in modern international football, is the ability to keep possession. John O’Shea looks like a fish out of water at right-back, and belongs on the other side of the defence. I’d also like to see Leon Best getting a shot in one of the pre-tournament friendlies, maybe with Shane Long. It’d be nice to see a viable alternative to Robbie Keane and A.N. Other. And also, while I realise Ireland will never be Barcelona (not sure why you have to make that kind of transition as an alternative to playing terrible football, but hey…), surely the likes of Richard Dunne and Sean St. Ledger could have the confidence to do something besides booting the ball as far away as they possibly can at every opportunity? Ireland for the quarter-finals, I reckon. I think we’ll frustrate at least two teams in whatever group we’re in. Also, I reckon England will do far better than people think, particularly if Capello decides to take the bull by the horns, and play a defensive, stifling style of play that’s been in evidence in the last few home games – far more commensurate with the type and quality of player at Capello’s disposal, and there’s no better coach in world football to make such tactics work. No Wayne Rooney. Hmm. Strong line up though. Good to see Nani and Young back together on the flanks. Smalling, Rafael and Gibson fit too.